Everybody knows by now that diets high in carbohydrates are going to cause problems in most people. These problems can be severe. I'm talking about cancer, heart disease, diabetes, obesity, fatigue, and all kinds of bowel disorders. Sure there are anywhere from 8-12% of people who are genetically blessed with systems that do well eating a lot of carbohydrates. But the majority doesn't. Now a new study is shedding light on one more complication of a high-carb diet — hearing loss. And the numbers may surprise you. As you may know, elevated blood sugars can cause destruction to all kinds of tissues and organs. This includes the nerves, kidneys, immune system, arteries, and so forth. So the researchers in this study were curious if elevated sugars might also lead to the kind of hearing loss that can happen with age. To find out, they measured the hearing of 2,956 men and women all older than 50. Then they measured how much carbohydrate they ate by looking at how many high Glycemic Index foods they were eating and what their Glycemic Load was. Just so we're all on the same page, the Glycemic Index is a list of foods that are rated according to how fast they raise blood sugars. Carbohydrate foods that are higher on the Glycemic Index are the ones that raise sugars faster. They have the least amount of fiber for the amount of starches and sugars they have. The Glycemic Load is the Glycemic Index of the particular carbohydrate food multiplied by the amount of it that you eat. Many experts think that the Glycemic Load is actually more important than the Glycemic Index. That's because it not only takes into account the sugar-raising impact of the food, it also takes into account the total amount of sugar you are eating. This study looked at both the Glycemic Index and the Load. Here's what they found. The people who ate the most high-Glycemic-Index carbohydrates were 41% more likely to have hearing loss than those who ate the least amount. That is very significant. But it was even more significant when they looked at Glycemic Load. People eating the highest Glycemic Load were 76% more likely to have hearing loss than those with the lowest loads. So does eating carbohydrates increase your risk of losing your hearing? Most definitely yes. The fewer high Glycemic Index carbs you eat, the better. And eating fewer total carbohydrates is even more important. So keep your diet nice and low in the high Glycemic Index carbohydrates. You can find a list of them in my book The Type 2 Diabetes Breakthrough. And when you do eat them, make sure to have only a taste. Keep the total amount way down. Nobody wants to lose their hearing. But simply not wanting to lose your hearing doesn't stop it from happening. And it is extremely common. 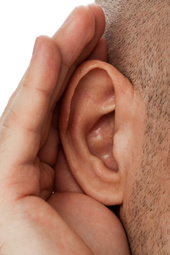 Roughly 30% of people over the age of 60 have some degree of hearing loss. And is their hearing going to get better as they get older? No. Just like everything else, it is only going to get worse with age. So protect your hearing and keep a lid on the carbs. If you already have hearing loss, I would suggest that you not only cut the carbs out, but you also give supplements a try. Advanced Bionutritionals makes a product called Advanced Hearing Formula that has natural supplements that have been shown in separate studies to improve hearing loss. Not surprisingly, many of the supplements in this product also work to lower blood sugar levels. Gopinath B, Flood VM, McMahon CM, et al. Dietary glycemic load is a predictor of age-related hearing loss in older adults. J Nutr. 2010 Dec;140(12):2207-12.